Just start the game, you have the option to choose the original or modern settings. Basically, affect the control and HUD (for TV tube or panoramic). 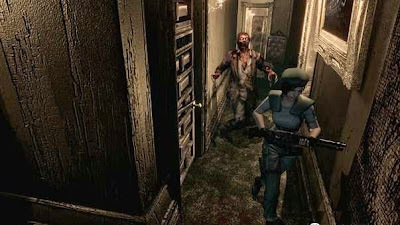 The main novelty lies in the possibility of using defense items such as daggers, which only serve as a zombie attacks directly. L1 BUTTON - pointing gun / fighting stance. L2 BUTTON - Use Item defense (only when a zombie attack you). L3 BUTTON - no function. R1 BUTTON - use equipped weapon. R2 Button - open map. R3 BUTTON - no function. TRIANGLE BUTTON - open inventory (drop down to – Exit- Left – File – Map - center and right). CIRCLE BUTTON - no function. SQUARE BUTTON - no function. X Button - open door / interact with objects. BUTTON L1 + Left Analog stick: point and changing lenses. BUTTON L1 + Right Analog stick: fighting stance and changing lenses (only the knife). BUTTON L1 + O: reload weapon. LEFT ANALOG STICK: control character / drag objects (in the direction of an object). LEFT ANALOG STICK + SQUARE BUTTON: do sprint.